When zucchini plants are producing, there seems to be no stopping them, spurring jokes about how to best get rid of the vegetables and entire cookbooks are devoted to cooking with them. This fact makes it especially frustrating when your zucchini, a member of the summer squash family, isn’t growing anything and despite your best intentions, there’s nothing to harvest. To get zucchini plants to bear fruit, you’ll want to do your best to care for the plants and help pollinate them to ensure vegetables start to grow. Give the zucchini a good start by testing the soil before you plant and treat it by adding 3 inches of compost or well-rotted manure to the soil if nutrients are low. 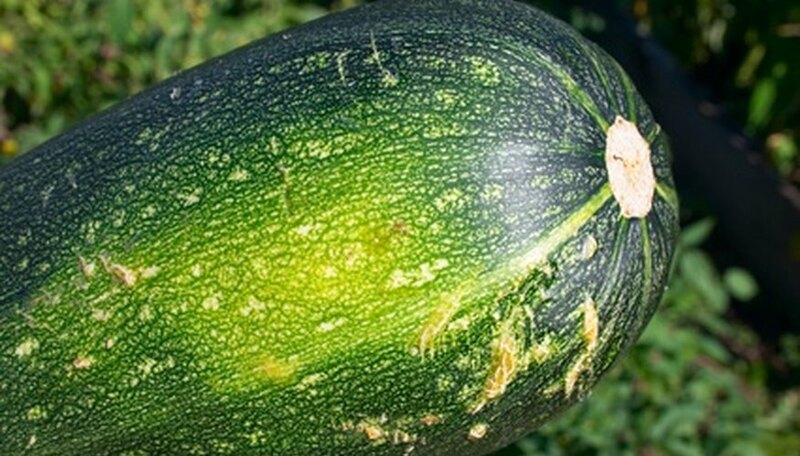 Zucchini prefers adequate levels of nitrogen, phosphorus, and potassium as well as a 5.5 to 6.8 pH. Interplant your zucchini bed with nasturtiums and marigolds throughout. The flowering plants can help bring pollinators to the area and therefore to the zucchini to increase the chances of bearing fruit. Keep the zucchini’s soil well watered once or twice a week so it stays consistently moist but not sopping wet. When you water, do so earlier in the morning and be sure to water at the soil level without wetting foliage to keep disease away. Help pollinate the zucchini with a brush or Q-tip by gently brushing inside the male flowers, which have a slender stem behind the flower, to collect the pollen. Dust inside the female flowers, which have large, thick ovaries behind the flower, with the pollen-loaded brush, working gently so you don’t break any part of the flower off. Fertilize the zucchini with a low-nitrogen 5-10-10 fertilizer when you first see the fruits behind the female flowers begin to develop. You can repeat fertilizing monthly, as desired, but further fertilization may lead to more leaves rather than more or larger vegetables. Apply pesticides if you see aphids or other pests invading your zucchini as soon as you spot the problem. Look for signs of powdery mildew, a white dust over the surface of the leaves that turns them brown in time, and use fungicides as soon as possible. To help ensure success, use crop rotation and be sure to plant your zucchini in a different location each year. Some decrease in production is natural if the weather around your garden reaches above 90 to 100 degrees. If this occurs you will see flowers, but they will drop off to protect the plant from exhausting in the heat.